Jan 4, 2018 The new version is now in effect. Dec 30, 2017 A new version has been posted that will be effective on January 1, 2018. May 4, 2016 Minor terminology update. Apr 2, 2016 A few links have been updated. Mar 26, 2016 The link changes published on March 4th 2016 have been reverted. Mar 4, 2016 A few links have been updated. Oct 15, 2015 Several new changes added including a new question: "How do I manage or opt out of uses of information about my Comcast account?". Jan 5, 2015 A new version has been published, with many changes made throughout. Note that the "Revised and effective" date in the document is August 1, 2014 but the changes were published sometime on January 5, 2015. Mar 1, 2011 This is the initial version that ParanoidPaul captured. It is not necessarily the first version of the document. This privacy notice applies to our cable video, high-speed Internet, phone and communications, and home security services. It describes the limitations imposed on our collection and disclosure of personally identifiable information about subscribers, the nature of personally identifiable information we collect, how we use that information, when and why we may disclose that information and to whom, how long we maintain that information, how you can access your personally identifiable information, how you can set preferences and opt out of certain uses of information, and your rights under law and this notice concerning your personally identifiable information. 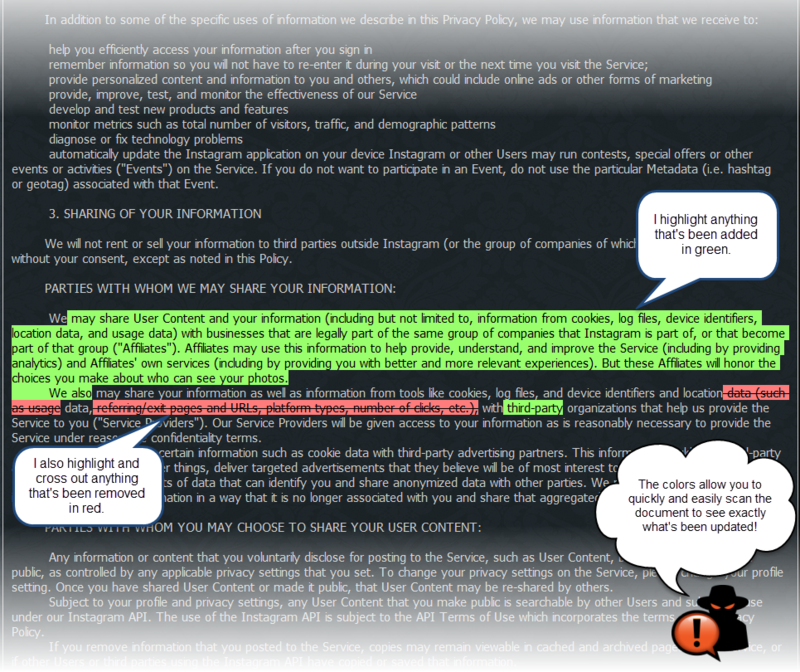 Please read the entire notice to understand our privacy policies and practices. You can also find answers to your specific questions quickly by using the links below. Why is Comcast providing this notice to me? What kind of information does this notice apply to? For what purposes may Comcast collect personally identifiable information and CPNI? What kind of personally identifiable information and CPNI does Comcast collect? What kind of information does Comcast collect if I use cable video services? What kind of information does Comcast collect and use to improve your cable services and deliver relevant advertising? How does Comcast use personally identifiable information and CPNI? How does Comcast use activity data and other data in connection with cable video service? How does Comcast use information about use of cable video services on other platforms like websites or mobile applications? Under what circumstances may Comcast disclose personally identifiable information to others? To whom may Comcast disclose personally identifiable information? When may Comcast disclose personal information to others in connection with phone service? When is Comcast required to disclose personally identifiable information and CPNI by law? How does Comcast protect personally identifiable information? How long does Comcast maintain personally identifiable information? How can I see my personally identifiable information or CPNI and correct it, if necessary? How do I manage or opt out of uses of information about my Comcast account? How do I give or withhold my approval for Comcast to use CPNI to market additional products and services to me? How do I place myself on Comcast’s “do not call” and “do not mail” lists? What e-mail communications will Comcast send to me and how do I manage them? What can I do if I think my privacy rights have been violated? Will Comcast notify me if it changes this notice? How do I contact Comcast? your rights under the Cable Act concerning personally identifiable information and its collection and disclosure. Personally identifiable information is information that identifies a particular person; it does not include de-identified, anonymous, or aggregate data that does not identify a particular person or persons. This notice is also provided to you in accordance with applicable California law, which only applies to our customers located in California who are served by a cable television corporation. information contained on your bill concerning the type of phone and Internet services and features you receive. That information is known as customer proprietary network information or CPNI for short. This notice, which includes our CPNI Policy, describes what CPNI information we obtain, how we protect it, and how it may be used. If you are a customer of our phone and Internet services, you have the right, and Comcast has a duty, under the Communications Act and applicable state law, to protect the confidentiality of CPNI. In addition, the FCC’s rules provide additional privacy protections specific to our phone services that we describe in this notice. We explain below under "HOW DO I GIVE OR WITHHOLD MY APPROVAL FOR COMCAST TO USE CPNI TO MARKET ADDITIONAL PRODUCTS AND SERVICES TO ME?" how you can approve our use of CPNI or withdraw your approval in the event Comcast decides to use CPNI for marketing purposes. Special Note: Our CPNI Policy applies to the voice and Internet communications-related services provided by the applicable Comcast operating company that delivers those services to our customers. The Cable Act applies to personally identifiable information that you have furnished to Comcast, or that Comcast has collected using the cable system, in connection with the provision of cable service or other services. The Communications Act applies to CPNI related to our regulated phone and Internet services, and certain orders of the Federal Communications Commission apply the CPNI rules to our interconnected voice over Internet protocol communications services. to detect unauthorized reception of cable communications. The Cable Act prohibits us from using the cable system to collect personally identifiable information concerning any subscriber for any purposes other than those listed above without the subscriber’s prior written or electronic consent. services necessary to, or used in, the provision of these services, including the publishing of directories. CPNI does not include your name, address, and telephone number, because the Communications Act classifies that information as "subscriber list information" which is not subject to the CPNI protections. However, that information is also subject to certain protections as described below under "To whom may Comcast disclose personally identifiable information?" The FCC has not yet adopted specific rules or definitions regarding CPNI as it relates to Internet access. additional information about the service options you have chosen. When you use cable video services, our cable system automatically generates information about your use of the services and their features, and we collect much of this information as part of providing services to you. For example, we receive information about the use of set top boxes, remote controls, electronic program guides, video players, applications, and other devices and software connected to our cable system. This information includes which channels, programs, and advertisements are viewed and for how long, for example. It may also include information about navigation through program guides and applications, and use of devices like remote controls and tablets. Except as described below, we collect this activity data without names and addresses or other personally identifiable information and we consider it de-identified data. Comcast’s cable system, set-top boxes, and other equipment generate activity data that we collect and store. We use this information for a number of purposes including to determine which programs are most popular, how many people watch a program to its conclusion, and whether people are watching commercials. As described below under "How does Comcast use personally identifiable information and CPNI?," we may also provide information like subscriber lists or certain de-identified, anonymous, and/or aggregate information (such as activity data) to third parties working on our behalf -- such as audience measurement or market research firms. We, or these firms, working as our service providers, may combine this information with aggregated or non-aggregated demographic information (such as census records) and other audience attributes, such as purchasing data, demonstrated interests (for example, in sports programs or movies), loyalty programs, organizational affiliations, advertiser customer lists, and the like to provide us with audience analysis data. We require third parties working on our behalf to treat all information we provide as confidential and to use it only for Comcast’s business purposes. We may also work with academic or research interest groups to analyze de-identified, anonymous, and/or aggregate information we provide to them for specific purposes or projects. to provide call location information concerning the user of a commercial mobile phone service. Comcast may not use CPNI to market products and services to you other than enhancements to services you already have without your approval in accordance with our policies described below. otherwise use the services and their features. We associate activity data with particular devices such as set top boxes, portable devices, and other supported devices so that we know where to deliver the services and how to troubleshoot them. In general, Comcast uses de-identified and aggregate activity information to understand better how our customers use our products and services so that we can improve them, including by delivering more relevant content and advertising. We may try to determine how well our products and services deliver value to our customers, for example, by determining which programs are most popular, how many people watch a program to its conclusion, and whether and how often people are watching commercials. As discussed below, we may also combine activity data with other non-personally identifying demographic and similar information from our business records. When we collect activity data, we may also use it to determine how many people view commercials (impressions) and to provide de-identified or aggregate reports to third-party advertisers. When we do this reporting on advertising impressions we do not provide any personally identifiable information about our subscribers to third-party advertisers. We, or our service providers, may combine de-identified activity data with other data to determine and report how an advertiser’s messages are viewed, including on other platforms and services. We may also use activity data to help us learn how popular certain programs are and how our customers as a whole generally prefer to view certain kinds of programming using cable video service (such as whether they like to watch certain programs live, or they prefer to view them when we offer them on demand, on mobile devices, or online). As described below, this may require us to compare or combine activity data on our cable system with online activity data. We may also use activity data to determine whether promoting content and services in certain ways helps attract a larger audience and more customers. While we may provide aggregate reports on these observations to programmers or others, we do not provide any personally identifiable information about our subscribers, or the activities of individual subscribers, to those programmers and others. We may also use, or combine information about, your use of our cable services with other information we obtain from our business records (such as your Comcast account number or device identifiers), or from third parties, to deliver better and more relevant products, services and advertising. However, we do not store or share your activity data in association with your name or address, except as necessary to render or bill for our services. We may try to determine, using aggregated data, which groups of our customers use which of our products and services and how they use them. To do this we, or third parties working on our behalf, may combine demographic and other generally available information, or advertiser information, including purchasing data and membership in loyalty programs, with our subscriber lists. From this information, we or our third party providers prepare de-identified and aggregated reports about how groups of customers with common characteristics – such as age and gender, or a demonstrated interest in a particular third party product – use our services and respond to the programming and advertising that we distribute. We may use this information to improve and communicate with you about our own products and services, and also to help us deliver relevant information and advertising on behalf of other companies and advertisers to certain subscriber groups – known as ad groups– who may be most interested in this information and advertising. When we do this, we do not share your personally identifiable information with these advertisers, unless you provide your express consent. of the names and addresses of subscribers for "mailing list" or other purposes (subject to each subscriber's right to prohibit or limit this disclosure and the CPNI Policy described below under "How do I place myself on Comcast's 'do not call' and 'do not mail' lists?"). We may disclose personally identifiable information as provided for in the Cable Act when it is necessary to render, or conduct a legitimate business activity related to, the cable service or other services we provide to you. These kinds of disclosures typically involve billing and collections, administration, surveys, marketing, service delivery and customization, maintenance and operations, incident verification and response, service notifications, fraud prevention, and services to improve our programming and advertising offerings, for example. We may also collect, use, and disclose information about you in de-identified, anonymous, or aggregate formats, such as ratings surveys and service usage and other statistical reports, which do not personally identify you, your particular viewing habits, or the nature of any transaction you have made over the cable system. The frequency of any disclosure of personally identifiable information varies in accordance with our business needs and activities. The Cable Act authorizes Comcast as a cable operator to disclose limited personally identifiable information to others, such as charities, marketing organizations, or other businesses, for cable or non-cable "mailing list" or other purposes. From time to time we may disclose your name and address for these purposes. However, you have the right to prohibit or limit this kind of disclosure by contacting us by telephone at 1-800-XFINITY or by sending us a written request as described below under "How do I contact Comcast?" Any "mailing list" and related disclosures that we may make are limited by the Cable Act to disclosures of subscriber names and addresses where the disclosures do not reveal, directly or indirectly, (i) the extent of any viewing or other use by the subscriber of a cable service or other service provided by us; or (ii) the nature of any transaction made by the subscriber over our cable system. We may sometimes disclose personally identifiable information about you to our affiliates or to others who work for us. We may also disclose personally identifiable information about you to outside auditors, professional advisors, service providers and vendors, potential business merger, acquisition, or sale partners, and regulators. We make these disclosures as provided for in the Cable Act. Typically, we make these disclosures when the disclosure is necessary to render, or conduct a legitimate business activity related to, the cable service or other services we provide to you. We may be required by law or legal process to disclose certain personally identifiable information about you to lawyers and parties in connection with litigation and to law enforcement personnel. If we (or our parent company) enter into a merger, acquisition, or sale of all or a portion of our assets, subscribers' personally identifiable information will, in most instances, be one of the items transferred as part of the transaction. If this notice will be changed as a result of a transaction like that, you should refer below under "Will Comcast notify me if it changes this notice?" We may transmit your name and/or telephone number to be displayed on a Caller ID device unless you have elected to block such information. Please note that Caller ID blocking may not prevent the display of your name and/or telephone number when you dial certain business or emergency numbers, 911, 900 numbers, or toll-free 800, 888, 877, 866 or 855 numbers. We may provide your name, address, and telephone number to public safety authorities and their vendors for inclusion in E911 databases and records, inclusion in “reverse 911” systems, or to troubleshoot 911/E911 record errors. We may publish and distribute, or cause to be published and distributed, telephone directories in print, on the Internet, and on disks. Those telephone directories may include subscriber names, addresses, and telephone numbers, without restriction to their use. We may also make subscriber names, addresses, and telephone numbers available, or cause such subscriber information to be made available, through directory assistance operators. We may provide subscribers’ names, addresses, and telephone numbers to unaffiliated directory publishers and directory assistance providers for their use in creating directories and offering directory assistance services. Once our subscribers' names, addresses, and telephone numbers appear in telephone directories or directory assistance, they may be sorted, packaged, repackaged and made available again in different formats by anyone. We make every reasonable effort to protect subscriber privacy as described in this notice. Nevertheless, we may be required by law to disclose personally identifiable information or individually identifiable CPNI about a subscriber. These disclosures may be made with or without the subscriber's consent, and with or without notice, in compliance with the terms of valid legal process such as a subpoena, court order, or search warrant. For subscribers to our cable video service, Comcast may be required as a cable operator to disclose personally identifiable information to a third-party or governmental entity in response to a court order. If the court order is sought by a non-governmental entity, we are required under the Cable Act to notify the subscriber of the court order. If the court order is sought by a governmental entity, the Cable Act requires that the cable subscriber be afforded the opportunity to appear and contest in a court proceeding relevant to the court order any claims made in support of the court order. At the proceeding, the Cable Act requires the governmental entity to offer clear and convincing evidence that the subject of the information is reasonably suspected of engaging in criminal activity and that the information sought would be material evidence in the case. You may examine and correct, if necessary, the personally identifiable information regarding you that is collected and maintained by Comcast in our regular business records. In most cases, the personally identifiable information contained in these records consists solely of billing and account information. We will correct our records if you make a reasonable showing that any of the personally identifiable information we have collected about you is inaccurate. If you have Internet access, you can view and change certain information yourself by going to //www.xfinity.com/myaccount and signing in with your Comcast username and password to access the My Account feature. If you are a home security customer, you can go to the subscriber portal at //www.xfinity.com/xhportal. You may also examine the records containing your personally identifiable information at your local Comcast office upon reasonable prior notice to us and during our regular business hours. If you wish to examine these records, please contact us by mail or telephone at 1-800-XFINITY, giving us a reasonable period of time to locate and, if necessary, prepare the information for review, and to arrange an appointment. You will only be permitted to examine records that contain personally identifiable information about your account and no other account. If you make an affirmative, written request for a copy of your CPNI, we will disclose the relevant information we have to you at your account address of record, or to any person authorized by you, if we reasonably believe the request is valid. However, subscribers to our phone services should be aware that we generally do not provide them with records of any inbound or outbound calls or other records that we don’t furnish in the ordinary course of business (for example, as part of a bill) or which are available only from our archives, without valid legal process such as a court order. In addition, we cannot correct any errors in customer names, addresses, or telephone numbers appearing in, or omitted from, our or our vendors’ directory lists until the next available publication of those directory lists. Further, we may have no control over information appearing in the directory lists or directory assistance services of directory publishers or directory assistance providers that are not owned by our subsidiaries or us. Various direct and indirect subsidiaries of Comcast Corporation offer many communications-related and non-communications related services, such as high-speed Internet and home security services. From time to time we may like to use the CPNI information we have on file to provide you with information about our communications-related products and services or special promotions. Our use of CPNI may also enhance our ability to offer products and services tailored to your specific needs. In addition, Comcast also offers various other services that are not related to the services to which you subscribe. Under the CPNI rules, some of those services, such as Comcast cable video services, are considered to be non-communications related products and services. Therefore, you may be asked during a telephone call with one of our representatives for your oral consent to Comcast’s use of your CPNI for the purpose of providing you with an offer for communications related or non-communications related products and services. If you provide your oral consent for Comcast to do so, Comcast may use your CPNI only for the duration of that telephone call in order to offer you additional services. HOW DO I PLACE MYSELF ON COMCAST'S "DO NOT CALL" AND "DO NOT MAIL" LISTS? You may contact Comcast at 1-800-XFINITY to ask us to put your name on our internal company "do not call" and "do not mail" lists so that you do not receive marketing or promotional telephone calls or postal mail from us or made at our request. You also have the right to prohibit or limit disclosure of your personally identifiable information for "mailing list" or other purposes as described above in this notice by contacting us at 1-800-XFINITY. We may send a welcome e-mail and sometimes other information to new subscribers to our cable service and other services (including each new secondary account holder, where applicable). We may also send service-related announcements to our subscribers from time to time. For example, we may send you an e-mail announcement about a pricing change, a change in operating policies, a service appointment, or new features of one or more of the cable service or other services you receive from us. You may not opt-out of these service-related communications. If you fail to check your primary e-mail address for service-related announcements, you may miss important information about our services, including legal notices, for example. As required by the Cable Act, we will provide you with a copy of this customer privacy notice at the time we enter into an agreement to provide any cable service or other service to you, and annually afterwards, or as otherwise permitted by law. You can view the most current version of this notice by going to http://www.xfinity.com/Corporate/Customers/Policies/CustomerPrivacy.html.